Lamb only makes an appearance on our table when we have a lot of people over for some occasion. Reason being, we are not lamb eaters, not being used to the meat that was never part of our food rotation or repertoire. Myself, I find I like lamb, and indeed do crave lamb every so often, but alas, this love is not an unconditional love. I love lamb in some applications, and do not even like it in some others. 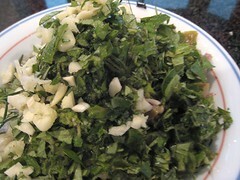 Mediterranean applications of lamb fall under the "love lamb" column. The Mediterranean ways of cooking lamb lends the meat just the right touch of gaminess for me, pleasantly gamey and not overpoweringly -- "fishily" -- so. I love doing legs of lamb because it always looks festive. 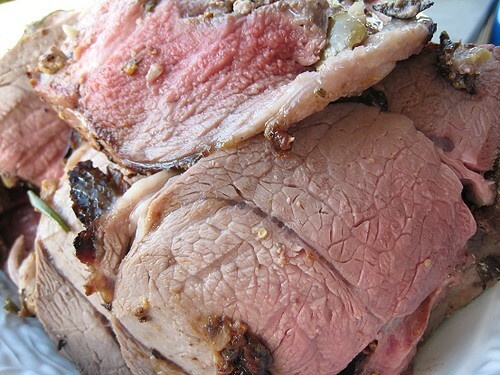 I love grilled leg of lamb and this is usually what we do. I started to prepare the marinade. As usual, I have no set recipe for these marinades. I just know that I want the lamb to be Mediterranean-ish, so I just chose ingredients that would fit within these constraints. I started looking around to see what I could add. Okay. Would add a little richness, a little tang, as well as tenderizing the meat a tad. A touch of mustard for more tang. Salt and pepper. 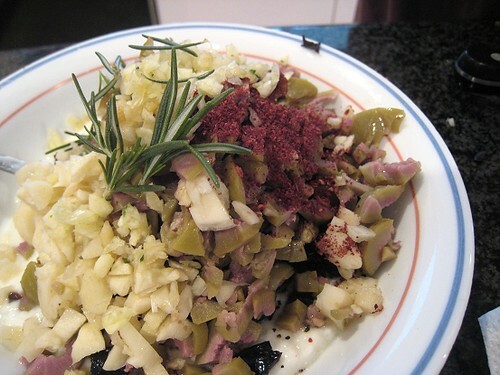 I saw that we still had olives so I set about chopping the olives to add to the marinade. 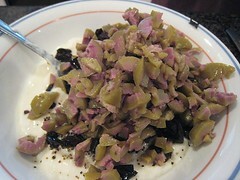 We had green and black olives. The key ingredient in tempering the gaminess of lamb has got to be garlic though, so I tend to use a lot of garlic in my marinades for lamb. This was no exception. Well, lookeee here! 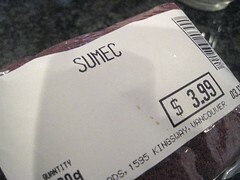 TS bought some sumac (which we unfortunately did not have for the lamb kofte). That goes in. I also found some rosemary in the fridge. 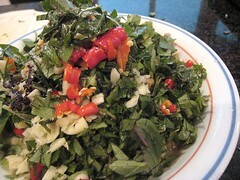 Fresh herbs were mint and oregano from the garden. And why not, a couple of birds' eye chilis. 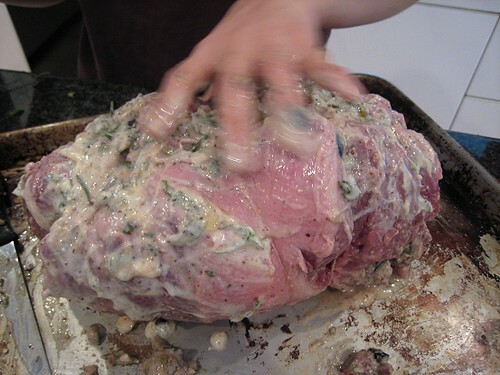 I started rubbing the marinade all over the lamb but the marinade was a tad chunky from the olives, so we had the idea of making this a stuffed leg of lamb instead. We've never stuffed a leg before, so I figure it was as good a time as any. Here's the inside of the leg. Being all thumbs, I enlisted TS to help me tie up the lamb. Here it is, a nice, oval bundle. 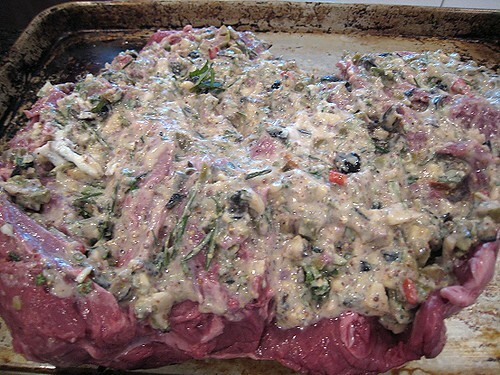 I rubbed the leftover marinade-slash-stuffing onto its outside as well. Onto the grill it went. Not having done a stuffed leg before, I think I was slightly off with the timing. I should have rotated the lamb while cooking to cook the leg more evenly. Here it is, all charred. TS also sliced the leg. The "stuffing" didn't look as nice as I had hoped. 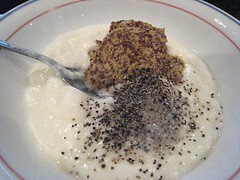 It was mainly because of the yogurt and the "curdled" look it had. But, this sure was delicious. oh my goodness i cant get out of my head this lamb!! delicious! 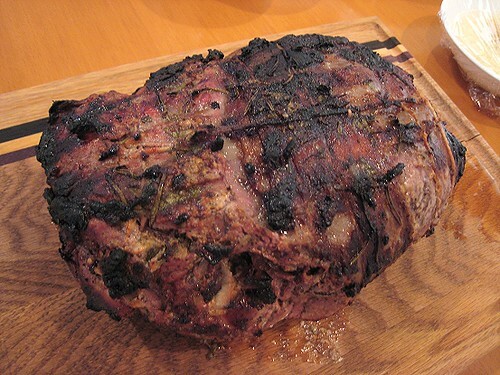 The lamb looks very appetizing and you both did wonderfully considering this type of meat isn't your usual fare. I would, as a Greek munch into this. 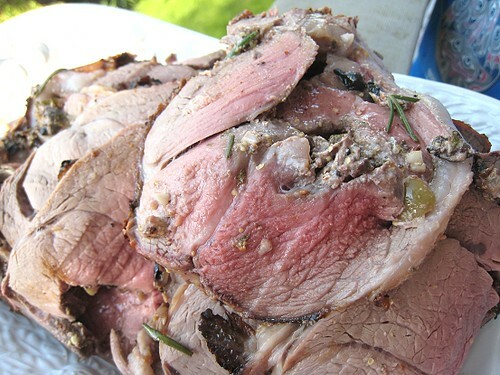 Lamb is actually one of my favorite meats and Mediterranean style is always perfect. This is the first time I've seen it with olives and it's definitely going to be bookmarked!